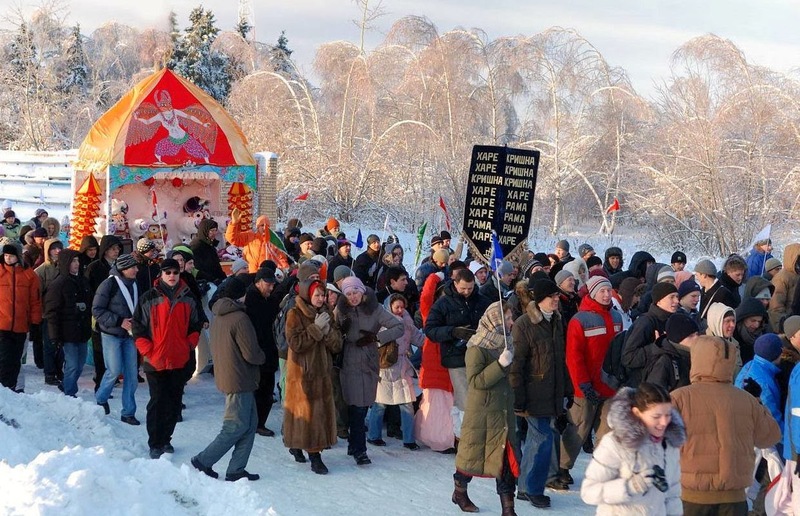 A Winter Ratha-Yatra? Help Us Source this Photo! ~ The Toronto Hare Krishna Temple! A Winter Ratha-Yatra? Help Us Source this Photo! We happened to come upon this incredible picture of what seems to be a "winter" Ratha-Yatra celebration. With the traditional chariot procession taking place, what makes this parade clearly so unique is the surroundings! With the ground covered in snow, devotees in their winter coats and even the Deities on the chariot dressed nice and warm, this certainly strikes us one of the more unique Ratha-Yatras we've ever seen. Have you seen this photo before? Care to take an educated guess where this is from? We're curious to know if any of our readers might be able to help us source this photo. Leave a comment with your thoughts or guesses! Aha! Perfect! Thank you for the information and link!